When life gives you lemons, make lemonade. When Mum gives you homemade lemon curd, make macarons! That is exactly what we did to observe World Macaron Day. So we added lemon flavoring and a sunny shade of yellow to basic macaron shells and filled them with Mum’s homemade lemon curd. 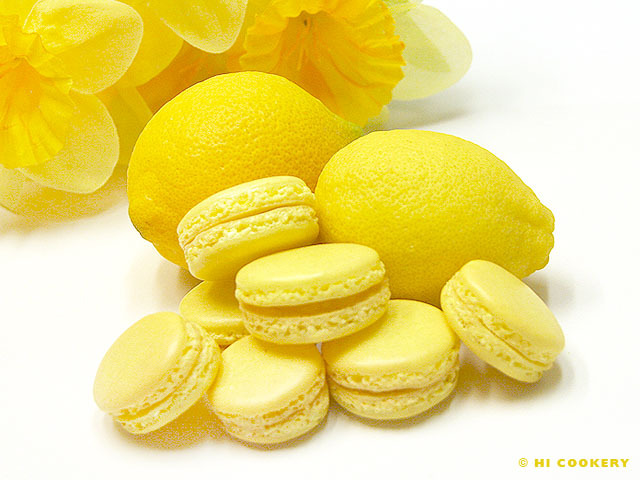 Take the opportunity to make lemon macarons as they are a wonderful way to welcome the spring season. Sift the almond flour/meal with the powdered sugar. Grind in a food processor in batches to remove any lumps (optional). Whip the egg whites until peaks form. 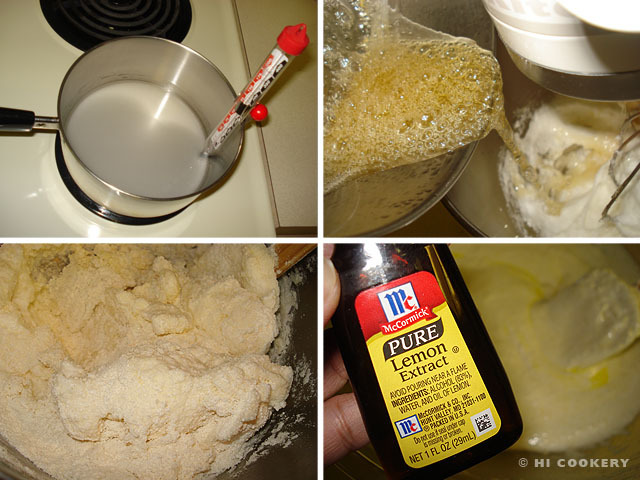 Make a simple syrup to stabilize the egg whites by boiling the sugar and water together until it reaches a temperature of 245 degrees F on a candy thermometer (or until it reaches a soft ball stage). Pour into the egg whites and whip again until stiff and glossy. Fold in the almond flour/meal-sugar mixture until the consistency “flows like magma.” Stir in the lemon extract. 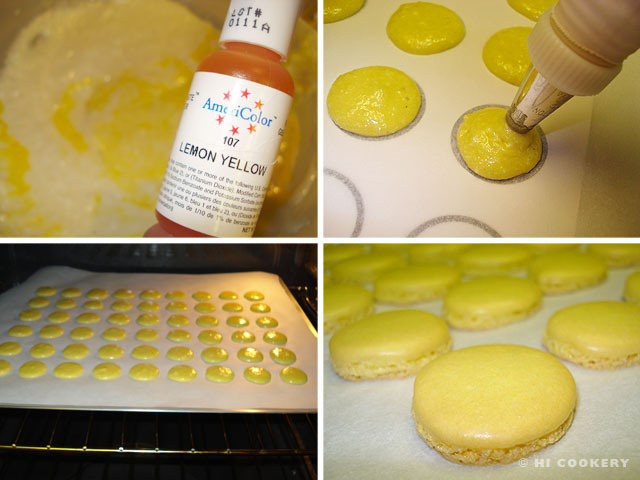 Tint the macaronage with yellow to make a sunny shade of lemon. Pipe one-inch discs on a parchment paper on top of an insulated baking sheet. Let the discs air dry to develop a thin skin for at least 30 minutes. Bake in a preheated oven at 300 degrees F for about 15-20 minutes. Watch the “feet” develop, but be careful not to brown or burn the macarons. Remove from the oven and let cool for 15 minutes. Peel off the macarons from the parchment paper. Sort by size and match pairs. Make the lemon curd filling. To complete the macarons, spread lemon curd between two shells. Sandwich them together and repeat the process for the rest of the shells. Refrigerate the macarons to set. Bring to room temperature before serving. Search our site for more macaron recipes. Or click on our MacAttack page to see our macaron gallery. Happy World Macaron Day! Dale Carnegie coined the famous quote: “When fate hands us a lemon, let’s try to make a lemonade” (see variations of the phrase at the Innocent English website). With this statement, he meant to encourage others to turn a negative into a positive position and to take the opportunity to change a disadvantageous situation into an advantageous one. Thanks to Highlander’s Mum for the lemon curd and recipe. 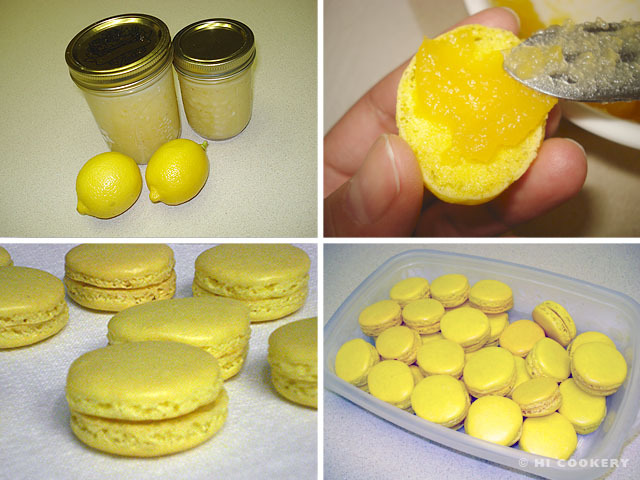 Store-bought instead of homemade lemon curd may be substituted for the lemon macaron filling. Thanks to Lisa L. for the ground almonds from Germany. See our Food Flops page for our lemon macaron mess. This post is our entry into the MacTweets monthly challenge #27 for World Macaron Day. Take a look at all the lovely macs on the site! 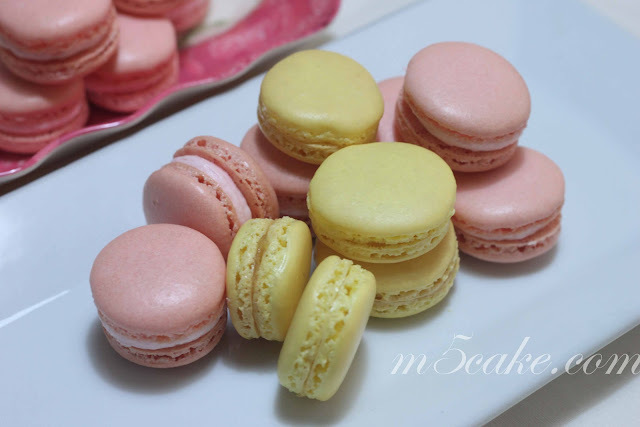 HI Cookery is proud to partner with M5 Cake to make macarons this month. See our lemon macarons paired with the strawberry macarons that we made together below and on their site. Happy Macaron Day & Happy Spring you inspired folk! These are gorgeous, fresh and exciting. 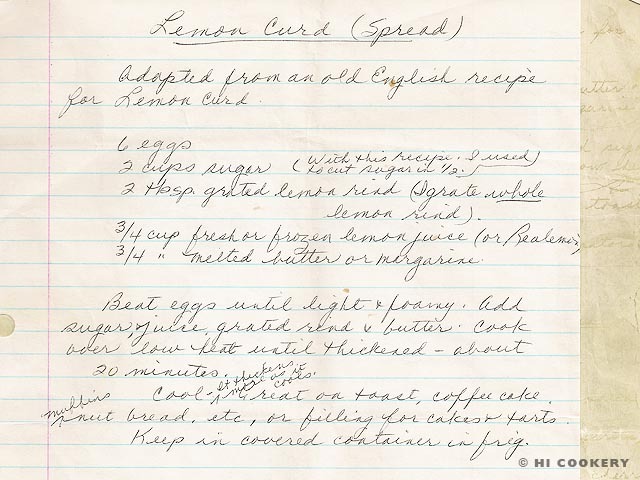 Love the image of the old hand written recipe. So charming and full of connect. Makes the macarons feel ever so special. Thank you for bringing the sunshine to MacTweets! I’m attempting to make lemon macarons again tonight. The first time the lemon curd was delicious but a bit runny (consistency not good for a macaron filling) how did you get your lemon curd so nice and thick? 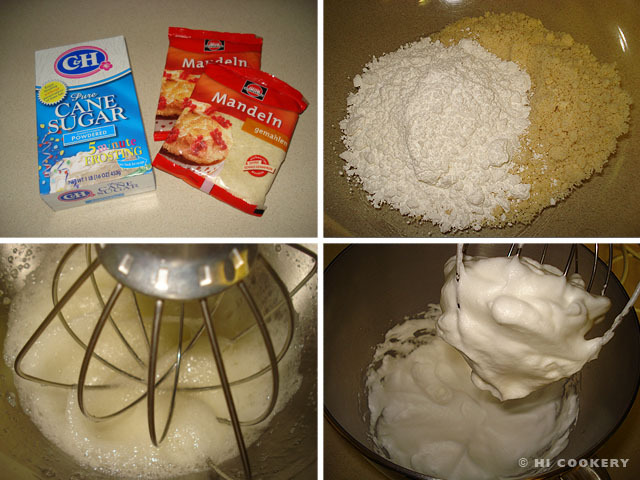 Did you use a whisk? Highlander’s mom gave us the homemade lemon curd, which tastes better than store-bought but is slightly thinner in consistency. Jam-type fillings as a whole tend to soften the macaron shells. Sometimes the curd and jam fillings get thicker when you set them in the refrigerator. Other times, we just spread the curd or jam on the macaron shells and eat them immediately!